Charity Fundraising. Over the last 38 years, Dave John B's It's a Knockout Roadshow has helped raise hundreds of thousands of pounds for many charities. It is a great way to get together your corporate sponsors, have a ball and raise lots of cash! Apart from the obvious money raised from team sponsorship, many other opportunities to raise money exist and include game and T-shirt sponsorship and arena banner advertising. Alzheimer's Scotland who kindly contacted us and together we both organised the event with impressive advertising, social media and event creation. We raised in excess of £26,000. Well done to all involved. It was a fantastic show and we look forward it again. Companies like banks, supermarkets , football and rugby teams, hairdressers, they all love to take part. If they cannot take part how about asking them to sponsor one of the games send a list out, like a wedding list, somebody may even sponsor the whole event. Some companies double what their staff have raised and are very keen to do a team building day, some even have a budget for it. Do you fancy yourself as a Fundraiser? At various venues throughout the UK organiser let us sell spaces to join in an existing event. Do you fancy yourself being an organiser? We have spaces available at venues throughout the U.K. We are offering 6 team spaces for 60 people to take part in our show. The idea is instead of booking a full show you can buy the places at £1000 for the package. You then charge £500 per team where contestants get sponsored for £50 each i.e: 25 Sponsors at £2 each. This way you will raise £2000 for your charity, project or cause. 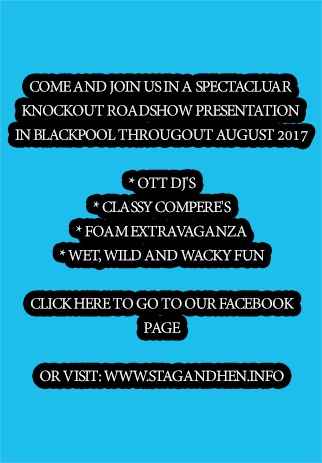 Please email info@itsaknockout.com for more details and venues available. This package is also ideal for stag, hen nights, birthday parties, celebrations, family get-togethers or general fun without having to raise the funds.